This fall, the nation rightfully recognized a son of New Mexico who has earned the description of "godfather of Chicano letters." As we reflect on the end of Hispanic Heritage Month, it's worth remembering the way this American writer has indelibly carved an important space in our literary canon. 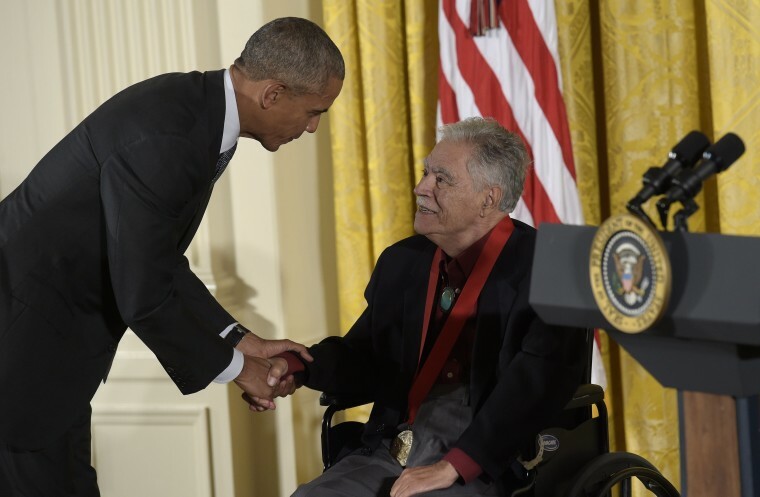 On September 22, President Barack Obama awarded Rudolfo Anaya, best known for his bestselling novel "Bless Me, Ultima," a 2015 National Humanities Medal, a long overdue commendation for the prolific author. "Bless Me, Ultima," first published in 1972, is set in the New Mexico town of Guadalupe just after WW II. This novel examines the dramatic cultural shifts that took place during that period as seen through the eyes of a schoolboy who is only beginning to understand the world outside his home. Guiding him through this education is Ultima, a curandera, or healer, in the final days of her life. The novel’s honest representation of the way differences in values and beliefs can test families and communities has secured its appeal over the years, since change is an ever-present struggle. The second powerful reason Anaya’s novel continues to make headlines is that it has been challenged or banned a number of times from high school reading lists because of what is considered offensive content. Critics have cited its strong adult language and Ultima’s faith-healing powers, which have been misconstrued as witchcraft. Despite these efforts, Bless Me, Ultima has persevered with a stage adaptation in 2009 and a film adaptation in 2013. Puerto Rican screen legend Miriam Colón played the titled role. Anaya’s literary output, however, is much more expansive. He has written over 40 novels, story collections, poetry volumes, children’s books and stage plays. And at 78, he’s still going strong, having released earlier this year the novel "The Sorrows of Young Alfonso," a novel in which an a seasoned writer reflects on New Mexico’s history and spirituality through a series of memories and letters. Anaya proudly considers this novel to be a perfect companion to the book that began his storytelling career, Bless Me, Ultima. It’s important to note that Anaya’s body of work celebrates the complex cultural heritage of New Mexico. Its Spanish, Mexican, and Native American roots are clearly present in Anaya’s descriptions of the state's cherished customs, festivities and folk beliefs. The international famous hot air balloon fiesta, for example, plays an important role in his Sonny Baca murder mystery "Rio Grande Fall," a matanza (the butchering and cooking of an animal) is arrestingly described in the novel "Alburquerque," and two of his children’s books pay homage to the state’s green chile and to the New Mexico Christmas mainstay — the farolitos, or paper lanterns that have become an iconic Christmas scene. For Latino writers, Rudolfo Anaya has been an important literary mentor in two ways. On the page, he's a writer whose prolific output exemplifies an admirable work ethic, and whose respect for his cultural heritage shapes the landscape of his plots and settings. Off the page, Anaya is an unapologetically Chicano and Nuevo Mexicano artist and a firm champion of the author’s right to freedom of expression. Not long before he traveled to DC to receive his National Humanities Medal, I had the opportunity to speak with Mr. Anaya over the phone. I had been enlisted by the National Endowment for the Humanities to write a profile of the honoree. After a brief interview, I was reminded of another of Anaya’s well-known characteristics, his sense of humor.